(Nanowerk News) One of the impediments to developing miniaturized, "squishy" robots is the need for an internal power source that overcomes the power-to-weight ratio for efficient movement. An international group involving Inha University, University of Pittsburgh and the Air Force Research Laboratory has built upon their previous research and identified new materials that directly convert ultraviolet light into motion without the need for electronics or other traditional methods. The research was published today in the journal Nature Communications ("Photomotility of polymers"). The group includes M. Ravi Shankar, co-author and professor of industrial engineering at Pitt's Swanson School of Engineering. Lead author is Jeong Jae Wie, assistant professor of polymer science and engineering at Inha University, South Korea. The experiments were conducted at the Air Force Research Laboratory's (AFRL)Materials & Manufacturing Directorate at Wright-Patterson Air Force Base, Ohio, under the direction of Timothy J. White. Other investigations have proposed the use of ambient energy resources such as magnetic fields, acoustics, heat and other temperature variations to avoid adding structures to induce locomotion. However, Dr. Shankar explains that light is more appealing because of its speed, temporal control and the ability to effectively target the mechanical response. 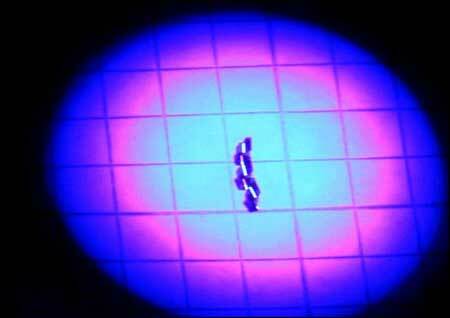 For the material, the group zeroed in on monolithic polymer films prepared from a form of liquid crystalline polymer. "Our initial research indicated that these flexible polymers could be triggered to move by different forms of light," Dr. Shankar explained. "However, a robot or similar device isn't effective unless you can tightly control its motions. Thanks to the work of Dr. White and his team at AFRL, we were able to demonstrate directional control, as well as climbing motions." According to Dr. Wie, the "photomotility" of these specific polymers is the result of their spontaneous formation into spirals when exposed to UV light. Controlling the exposure enables a corresponding motion without the use of external power sources attached directly to the polymer itself. "Complex robotic designs result in additional weight in the form of batteries, limb-like structures or wheels, which are incompatible with the notion of a soft or squishy robot," Dr. Wie said. "In our design, the material itself is the machine, without the need for any additional moving parts or mechanisms that would increase the weight and thereby limit motility and effectiveness." 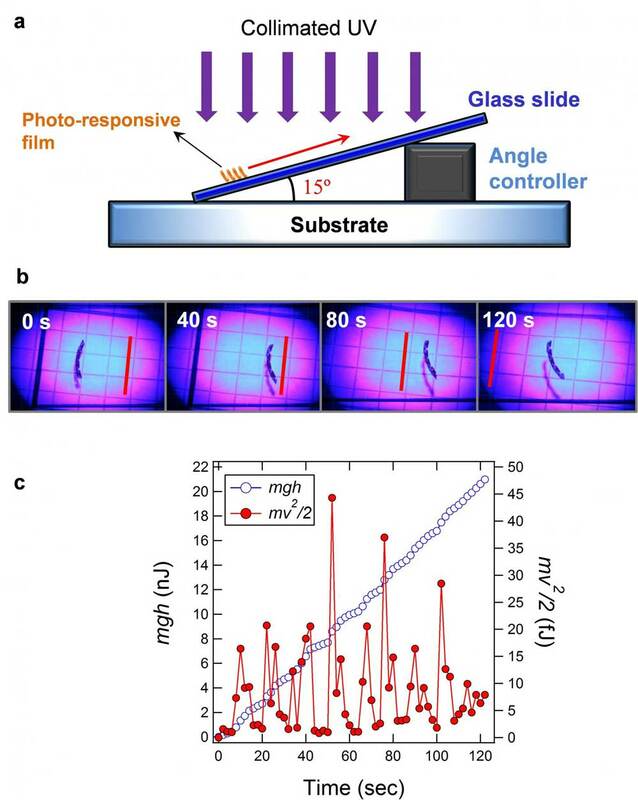 In addition to simple forward movement, Dr. White and the collaborative team were able to make the polymers climb a glass slide at a 15-degree angle. While the flat polymer strips are small - approximately 15mm long and 1.25mm wide - they can move at several millimeters per second propelled by light. The movement can be perpetual, as long as the material remains illuminated. "The ability for these flexible polymers to move when exposed to light opens up a new ground game in the quest for soft robots," Dr. Shankar said. "By eliminating the additional mass of batteries, moving parts and other cumbersome devices, we can potentially create a robot that would be beneficial where excess weight and size is a negative, such as in space exploration or other extreme environments."